We got the LG G Flex 2 in for review recently and the first thing we did was unbox it, bend it a bit and scratch it up. We wanted to see how good the self-healing back cover is now that it has been improved since the original LG G Flex. The results will shock you. No, really. Admittedly, the key I inadvertently used happened to be pretty sharp. But it was just a random key that does indeed live in my jeans pocket and I wasn't pressing very hard at all, so the level of pressure and physical properties of the key are absolutely representative of a real-world situation. Here's our LG G Flex 2 unboxing video (skip to the four-minute mark for the scratch test). 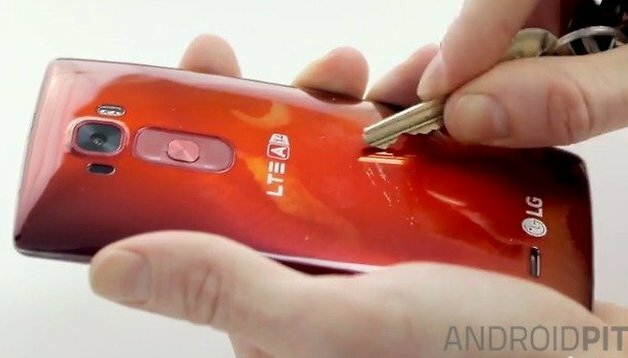 As you can see, the G Flex 2's self-healing technology on the back cover is absolutely destroyed by the very first swipe of the key across its surface. Those little micro-capsules of who-knows-what kind of marketing pixie dust have no chance of successfully filling in the gouges I made on my very first LG G Flex 2 scratch test attempt. Perhaps I was a little overly enthusiastic, perhaps my keys are supernaturally sharp, perhaps my G Flex 2 is still warm out the oven and hasn't set properly. Whatever the case, the results don't bode well for life-long LG G Flex 2 scratch-resistance and I will certainly be keeping my keys and G Flex 2 just as separate as I do every other phone I use. What do you think of this result? Was I too heavy-handed or is this pure marketing fluff unmasked? Honestly, my objection here is that your experiment was totally unscientific. You can't do just one test and expect to compare it against anything. A better way to do it, even if you were still stuck with only the one phone, would have been to put multiple scratches down the back at varying pressures. You probably scratched clean through the self-healing coating, which is absolutely a legitimate criticism -- it should stand up to the scratch you placed -- but that doesn't mean you can jump to the conclusion that the coating doesn't exist, or that it lacks the properties it claims to have. You can't test something's limitations with a single stimulus; you need a range. Not surprised the jig will be up on LG in 2015.